It is the goal of the First Choice Hospice team in Bluffdale, Utah to help our patients obtain the highest quality of life that they can for whatever time they may have left. Many of our patients have goals they want to achieve before they go: goals of seeing family members they have not seen for some time, going back to their homelands, going to Disneyland, or completing family history projects or quilts for family members. Hospice is a compassionate approach to care designed to provide support and comfort to patients and their families when a life-limiting illness no longer responds to cure-oriented treatments. Hospice is a philosophy of care that accepts death as a final stage of life. Hospice care affirms life and neither prolongs life nor hastens death. Hospice care treats the person rather than a disease; it focuses on quality rather than length of life. The goal of hospice care is to improve the quality of a patient's last days by offering comfort and dignity. Hospice care is delivered by a caring team of professionals that are specially trained in end of life care. Hospice services provide support for the emotional, social and spiritual impact of the disease on the patient and also on the patient's family and friends. During the final phase of a life-limiting illness there are unique physical, emotional, spiritual, social and financial needs that occur. First Choice Hospice in Bluffdale, Utah provides experienced, skilled nurses and clinicians who give needed help and support during this tender time. There are so many questions that can be answered by our Utah Hospice staff. They have spent their lives serving others and preparing patients for this new phase of life. There are many questions which can often bring anxiety. First Choice Hospice in Bluffdale, Utah is here to help. First Choice Home Health and Hospice provides free consultation over the phone and is willing to answer any questions you may have about either Home Health or Hospice. Please give us a call toll free at 1-888-377-4100. How can hospice help me to get the most out of my life? 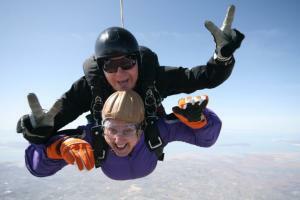 One of our Utah hospice patients was able to achieve a lifelong goal of being able to skydive. Here are some pictures of this event. Her story was so inspiring that she made the local and national news! 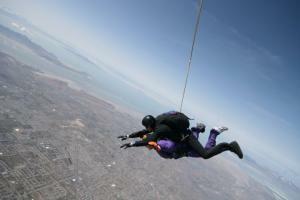 Click on the links below to hear her motivational story on Utah's KSL and Good Morning America.